How does Residence Life improve students’ academics? By providing immersive residential experiences that motivate them to succeed. 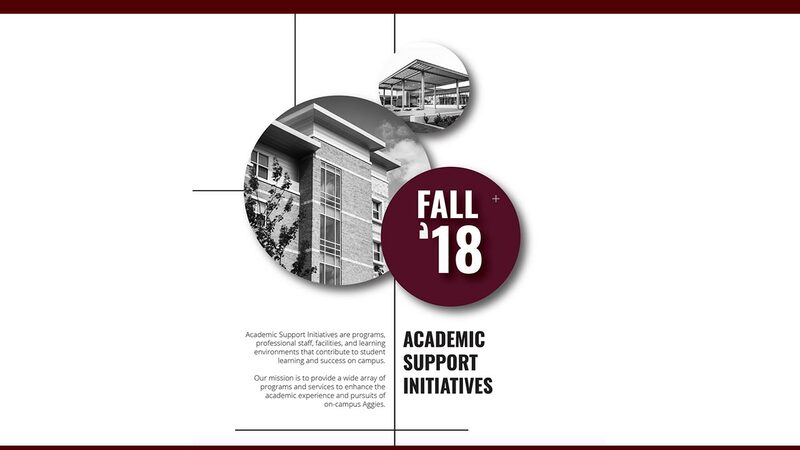 Academic Support Initiatives within Residence Life are programs, professional staff, facilities, and learning environments that contribute to student learning and success on campus. Our mission is to provide a wide array of programs and services to enhance the academic experience and pursuits of on-campus Aggies. Take a look at our impact numbers for the Fall 2018 semester. Study Spectacular occurs at the end of each semester from 8:00 am on Reading Day through 5:00 pm on the last day of finals. Large meeting rooms are open 24/7 during this time frame in order to provide our on-campus residents with a quiet environment that is conducive to their studying. Free coffee and snacks are provided throughout the event to keep students fueled for finals. In the fall semester, 6 locations were opened to residents with the following usage: Hullabaloo 117 (n = 412), White Creek Community Center (n = 93), White Creek Activity Center (n = 78), Gardens Community Learning Center (n = 143), Commons 109 (n = 289), and Hullabaloo 105 (n = 115). The Community Learning Centers (CLCs) are hubs of academic support. Located in the Gardens Activity Center, Hullabaloo Hall in Room 126, Southside Commons Lobby in Room 101, and White Creek Community Center in Room 115, these facilities offer individual and group study space and an open-access computer lab. Throughout the semester, a number of students took advantage of these spaces and visited us. Our sign-ins for each location were: Westside CLC (n = 2,601), Gardens CLC (n= 9,149), Northside CLC (n = 18,594), and Southside CLC (n = 42,586). Dinner with a Prof is a monthly event hosted 3 times in the fall in which on-campus residents have the opportunity to engage in dialogue with faculty, outside of the classroom. In total, 148 students attended this series. 498 individuals checked out 3,977 White Creek Community Center recreational resources; this provided much-needed study breaks and opportunities for community development. Honoring Excellence is a formal ceremony in which Texas A&M University students are given the opportunity to nominate faculty and staff members for awards and recognizes on-campus students who have demonstrated academic and leadership excellence, including those who achieve Distinguished Student status (Student Rule 11). The 296 Fall 2018 on-campus students who achieved distinguished student status were honored at the spring awards program. Academic Peer Mentors (APMs) support students’ academic and social development by connecting students with resources and programs to enhance student learning. This allows students to combine the classroom experience with their residential academic environment in order to establish a foundation for a successful college career. APMs are upperclassman certified by the College Reading and Learning Association. APMs live in on-campus residence halls or apartments and foster a sense of academic community through providing academic programs and services. In the fall semester 10 different academic skills presentation topics (i.e. time management, academic rebounding, study skills) were presented at various times within our residence hall and apartment communities. 6 peer panels ranging from study abroad to undergraduate research were offered that served 75 students. 123 students enrolled in the Academic Check-Up program and they met 289 times with Academic Peer Mentors. Finally, APMs worked with Resident Advisors (RAs) to offer 40 collaborative programs.